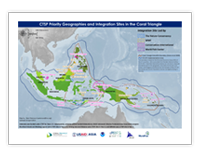 Showcases maps that highlight the diversity and uniqueness of the Coral Triangle region and the pressing issues that are threatening this very important resource. To get the next maps in the series join our mailing list. Total area of ocean within the CT is 549,223,129 ha of which 81,868,214 ha is coastal shelf (0-200m deep). Total coastline of the CT is 132,636 km (82,416 miles). Total area of coral reefs in the CT represents 30% of the World's coral reefs. The CT comprises just over 1.5% of the world's total ocean area (Veron et al. 2009).